Students prepare to load donated cans onto a Manna Food Center truck. 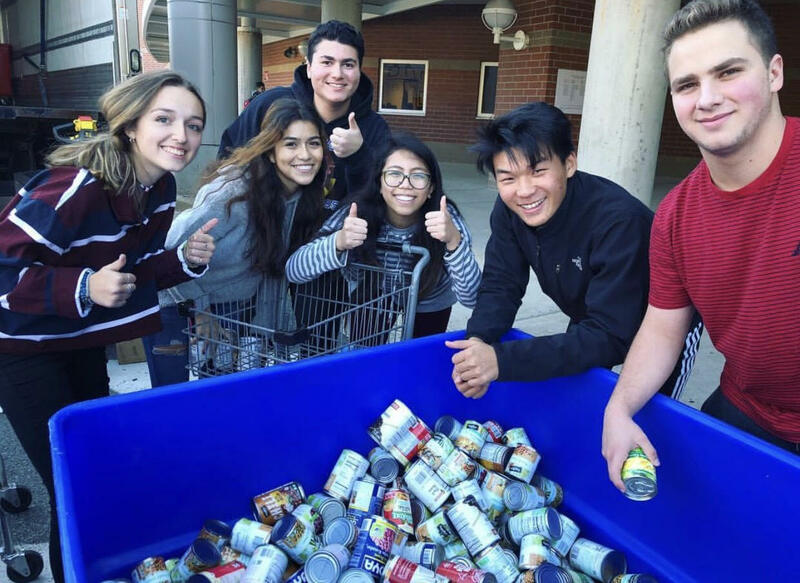 This Thanksgiving season, RM SGA followed long-standing traditions and organized the annual Canned Food Drive to give back to their community. From Oct. 22 to Oct. 26, SGA representatives roamed the hallways during first period, asking each teacher if they had cans. RM students donated over 400 cans in total to compete for the prestigious and legendary Omelette Man. Math teacher John Chase’s sophomore IB Precalculus class came in first place. Students donated around 170 cans, with Mr. Chase encouraging them and assigning it for homework. “But I didn’t do anything too crazy,” Mr. Chase said. Sophomore Joanna Ge, a student of the winning class, donated a whopping 20 cans of vegetables, tuna, soups, and more. “I thought it was good to give back to the community and the Canned Food Drive seemed like a great opportunity for me to help out,” Ge said. Mr. Chase’s class was rewarded with a breakfast by the Omelette Man, and other classes who donated over 100 cans, such as math teacher Kristina Petulante’s class, were rewarded with juice and doughnuts. Mr. Chase, although triumphant in his victory, made the point of noting where the cans are actually going. “Oh, it’s a great cause. It’s fun to win things, but of course the most important thing is that we’re able to help people out, so props to the SGA for running a good campaign for a good cause,” he said. Manna employs a variety of programs to eliminate of hunger in Montgomery County, including Food for Families, Farm to Food Bank, and Community Food Rescue. Statistics that Manna released this May indicate that it has accepted and shared over four million pounds of food, giving 200 students in the county the help they need. Over the past few years, many high schools in Montgomery County have coordinated their own food drives for Manna Food Center. RM has always been a reliable source, providing a large numbers of cans to Manna each year. However, this year the number seems to have decreased. “I think we did a good job this year, but many other years, there have been many more cans—like other teachers have brought in tons and their classes bring lots and lots of cans. I think maybe it was just a weaker year all around,” Mr. Chase said.